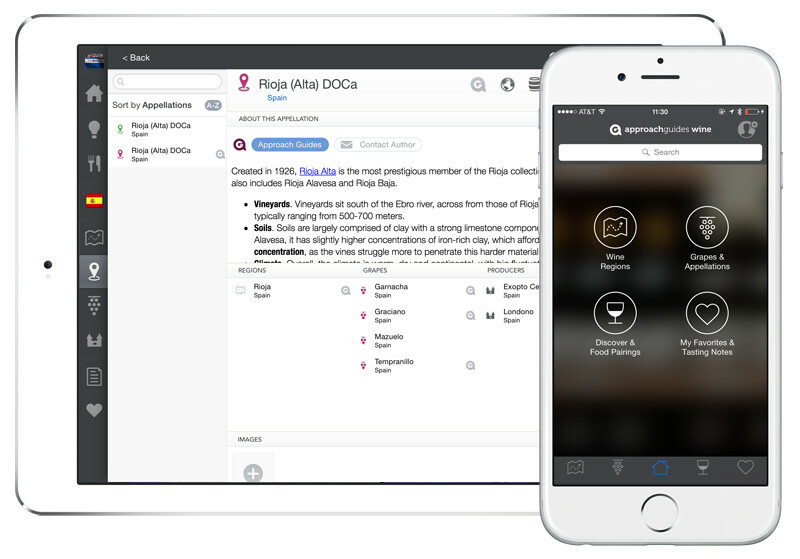 Navigating Spanish wine lists can be a bit tricky: they are full of indigenous grape varieties and each region has its distinct offerings. 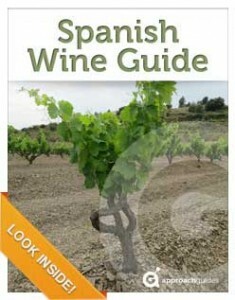 This guidebook explores Spain’s wines, region by region, denomination by denomination. Wine guides for the ultra curious, Approach Guides take an in-depth look at a wine region’s grapes, appellations and vintages to help you discover wines that meet your preferences.The purpose of this guide is to profile the unique aspects of Spain’s appellations and grape varieties; this guide does not profile specific producers or rate individual wines. With this guide, we explore perhaps the most dynamic wine-producing country in world, Spain: from the complex garnachas of Priorat, to the enticing vedejos of Rueda, to the enigmatic sherries of Jerez. In addition to being great values, the wines of Spain are exciting, as they are based on many little-known indigenous varieties. 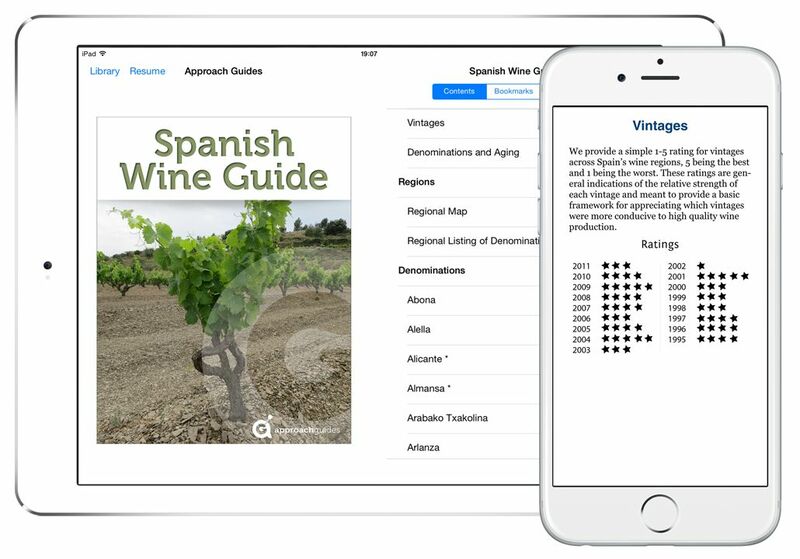 Equally valuable as a travel guide and wine shop companion, this Approach Guide is designed as a quick-reference resource for wine enthusiasts seeking to understand what makes Spain’s wines unique and make informed choices. Grape varieties. We describe Spain’s primary red and white grape varieties and where they reach their highest expressions. Vintage ratings. We offer a straightforward vintage ratings table, which affords high-level insight into the best and most challenging years for wine production in Spain. Denomination profiles. We provide detailed profiles of each of Spain’s denominations. For each denomination, this guide describes the prevailing terroir, the types of wine produced and what makes them distinctive. Recommendations. We mark our favorite denominations with asterisks (*) — our selections have a record for providing quality, consistency and good values. Information the way you like it. 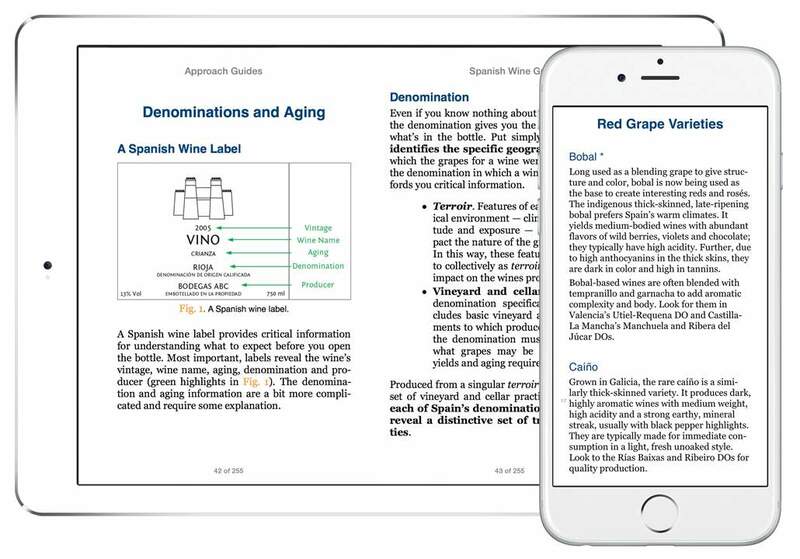 As with all of our guides, this book is optimized for intuitive, quick navigation; information is organized into bullet points to make absorption easy; and links are provided to the best online resources.